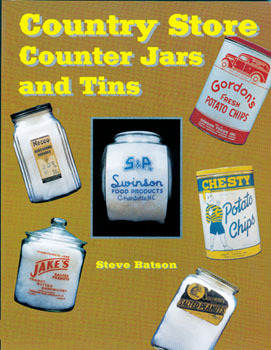 Dimensions: 8 3/8" x 11"
This book gives a nostalgic glimpse at the glass distribution jars, tins, boxes, and display racks which held American's favorite cookies, candies, and snack foods in America's quaint country stores. These items are chronicled and illustrated in over 390 color photos and contains the histories, covering over 100 years of the companies that used them - from Adam Gum and Dixie Biscuit to Planter's Peanuts and Wise Potato Chips. It includes detailed listings of the variations among their distribution jars and lids over the decades. Mergers among the snack food giants and the major marketing and distribution trends and the dates associated with them are also described in detail and provides the values for the distribution jars and their variations. This well documented book would be a great buy not just for collectors and those with an interest in Country Store jars and tins, but any antique enthusiast.